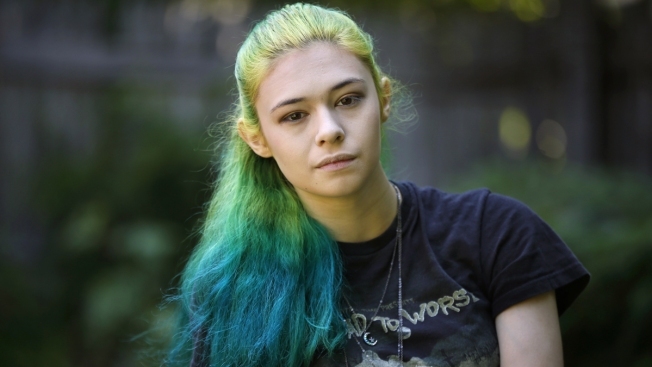 In this June 26, 2016, file photo, Nicole Maines poses at her home in Portland, Maine. Maines, a transgender activist who won a discrimination lawsuit after her school refused to let her use the girls' bathroom will be TV's first transgender superhero. An activist in Maine who won a lawsuit over using the girls' bathroom at her school is making her TV debut as a transgender superhero. The Bangor Daily News reports 21-year-old Nicole Maines will appear on Season 4 of The CW's series "Supergirl" Sunday. The Orono native will play Nia Nal, also known as Dreamer. Producers say the character is a "soulful young transgender woman with a fierce drive to protect others." The character is believed to be the first transgender superhero on U.S. television. Maines gained attention for her lawsuit against her school district after her elementary school said she could no longer use the girls' bathroom. Maine's highest court ruled in 2014 that officials violated state anti-discrimination law. Maines has made previous TV appearances, including the show "Royal Pains" and the HBO documentary "The Trans List."